The government has refused to publish the court's ruling because to do so would make it binding. Critics say the changes would limit the court's ability to scrutinise government legislation. The Polish government has refused to publish the court's decision, saying the judges were not following the very rules they were evaluating. Last month, a draft report by the Council of Europe - a human rights watchdog - said the changes made it extremely difficult for the court to take decisions, thereby endangering the rule of law. 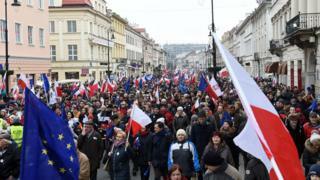 Video Why is Poland's government worrying the EU?